Carol Singletary asked the Lowndes County Board of Commissioners to go on the record as being opposed to the Sabal Trail pipeline. 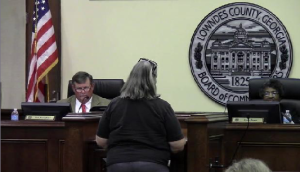 She reminded Lowndes County Board of Commissioners of their mission statement at the October 22, 2013 regular session meeting. She told them about her interactions with Sabal Trail and implored them to work for the good of the citizens who elected them. You have a way to help the citizens of Lowndes County. … If you go on record saying you don’t have any impact, where does that leave us?